Please consider the ideas in this article and comment as appropriate if you wish. Your feedback is sought and will be greatly appreciated. She speaks for me......... and for you, as you are reading this. Summary For Charged Particles in the Twin Slit Experiment. The Link Between the Micro & Macro Worlds. An Implication of This Electron Model. Magnetic Field Influence Upon Spectral Emissions. Photon Emission From A Heated Body. Gravitational Lensing in the Absence of Space-Time Distortion. And Then There is This One To ‘Unite’ Everything. Formation of Matter From Energy. Professor Richard Feynman’s interpretation of the observed results of the twin-slit experiment were incorrect? Thomas Young’s twin slit experiment at the beginning of the 19th century seemingly put paid to Newton’s claim that light is a particle and more recent analysis of the experiment by luminaries such as Professor Richard Feynman endorsed the findings that the resulting interference patterns are caused by light waves adding to and subtracting from each other. Please consider the following analysis of The Feynman Double Slit experiment. This analysis reveals Feynman’s use of an erroneous comparison between the behavior of packets of electromagnetic energy and mechanical energy propagating in a substances such as water, the air and other material things. It also incorporates a different concept of photon interaction with matter, a concept able to explain the patterns formed in the experiment without the energy being summed as has traditionally been the case. The idea referred to here is elaborated upon later in the document. The section that follows consists of an edited version of an article produced by Professor David M Harrison of the Department of Physics at the University of Toronto and provided under the Creative Commons License. The article is an excellent presentation of Professor Richard Feynman’s analysis of the double slit experiment and the alterations and additions I have include point out where Feynman erred. Within the article you will find my comments and additions in red and some amplifying notes also in red at the end of this section. An understanding of some of my entries may not become clear until later in the document. B. to incorporate an interpretation based on the ‘charged photon’ proposed by Agnosco Ignis. Feynman said of this experiment that it has in it the heart of quantum mechanics and that in reality, it contains the only mystery. Can we dispel that mystery? Here we discuss one of the two major paradoxes that we use to introduce Quantum Mechanics. 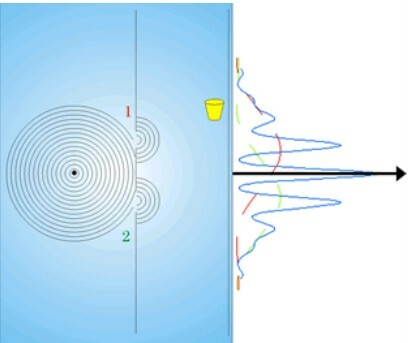 It is the double slit experiment for bullets, water waves and electrons. Although many people have experimented with the systems to be discussed and written about them, Richard Feynman's treatment is so clear that physicists often call it the "Feynman" double slit. At the end, 2 references are given so you may read the "master" on this topic. Operational Definitions for "Particles" and "Waves"
I administer the Stanford-Binet IQ test to a person and score the result. The person's intelligence is the score on the test. First we discuss "particles" and will take as our prototype bullets from a machine gun. [These are not equivalent to electrons or photons interacting with matter at the atomic scale.] We have the machine gun, a piece of armor-plate in which two small slits have been cut, labeled"1" and "2", a detector and a solid armor-plate backstop. The detector is quite simple: it is a can in which we have placed some sand. We will turn the gunner loose for, say, a 1 minute burst, and then see how many bullets arrive in the can. We empty the can, and then move it to a different position on the backstop, turn the gunner loose for another 1 minute burst, and see how many bullets have arrived at the new position. 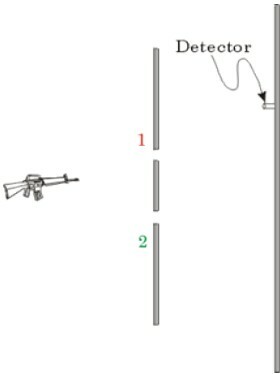 By repeating the procedure, we can determine the distribution of bullets arriving at different positions on the backstop. It turns out the the machine gunner is drunk, so that he is spraying the bullets randomly in all directions. The apparatus is shown to the right. We will do three different "experiments" with this apparatus. First we close up the lower slit and measure the distribution of bullets arriving at the backstop from the upper slit. For some bullet sizes and slit widths, although many bullets will go straight through the slit a significant fraction will ricochet off the armor plate. So the distribution of bullets looks as shown by the curve to the right. Next we close up the upper slit, and measure the distribution of bullets arriving at the backstop from the lower slit. The shape, shown as the curve to the right, is the same as the previous one, but has been shifted down. Finally, we leave both slits open and measure the distribution of bullets arriving at the backstop from both slits. The result is the solid curve shown to the right. Also shown as dashed lines are the results we just got for bullets from the upper slit and bullets from the lower slit. The result is just what you probably have predicted: the number of bullets arriving from both slits is just the sum of the bullets from the upper slit and the bullets from the lower slit. Now we turn our attention to waves. My high school physics teacher had a device called "ripple tank" which is just a tank made of plexiglass which could be filled with water. Various devices would tap the surface of the water, causing water waves to spread out from the device. One may insert slits and other objects in the path of the waves. The whole apparatus was mounted on an overhead projector, so could be used as a class demonstration. My teacher absolutely loved his ripple tank, so physics class was basically water-play. I don't know quite why he was so enamored with the device or what he expected us to learn from it, but to this day when I think of a prototype wave I think of water waves in a ripple tank. So we will repeat the double slit experiments we just did in a ripple tank. First we show the apparatus. The thing that is tapping the surface of the water is the little black circle in the middle of all the concentric circles. The concentric circles are the water waves spreading out away from the source. Just as before we have two slits and a backstop. Just in front of the backstop is our "detector", which is just a cork floating on the surface of the water. Se we measure how much the cork bobs up and down and determine the amount of wave energy arriving at that position at the backstop. Moving the cork to other positions will allow us the determine the distribution of wave energy at the backstop. Now we close up the lower slit, and measure the distribution of wave energy arriving at the backstop just from the upper slit. For some combinations of slit width and wavelength, there will be significant spreading of the wave after it passes through the slit. If you have ever observed surf coming in through a relatively small slit in a seawall, you may have observed this. The distribution is shown by the curve to the right. Note that it is very similar to the distribution of bullets from a single slit. Finally, we leave both slits open and measure the distribution. The result is shown to the right. As we did for the bullets, the dashed lines show the results we just obtained for the distribution from the upper and lower slits alone, while the solid line is the result for both slits open. This looks nothing like the result for bullets. There are places where the total wave energy is much greater than the sum from the two slits, and other places where the energy is almost zero. Such a distribution is called an interference pattern. This completes the "operational definition" that we need to define waves and particles. In the two slit experiment, a particle [of the nature discussed by the original article only, atomic scale charged particle interactions have not been considered.] does not show an interference pattern and the probability of a particle arriving at a location at the backstop with both slits open is just the sum of the probability of it arriving through the upper slit plus the probability of it arriving through the lower slit. A wave [in a material substance.] shows an interference pattern . We can explain the interference pattern for waves [in a material substance.]. When the two waves from the two slits arrive at some position at the backstop, except for right in the middle they will have traveled different distances from the slits. This means that their "waving" may not be in sync. [While this is a ‘seductively beautiful’ and easily visualised idea that appears to provide a satisfactory explanation for observed outcomes, what does it say about the first law of thermodynamics? If this concept is correct in the case of photons, which are packets of energy, the energy of each photon disappears. That is, it goes to nothing. Photons, unlike water waves or waves of compression in air or some other material, when in motion, always travel in the space between atoms [whether in intergalactic space or through glass or water for example]. They do not exist as forces influencing the physical distribution of some material substance. That is, in the absence of an aether they are not ‘waving’ anything. They are purely discrete packets of energy as described by Einstein. In ancient Greece there was a controversy about the nature of light. Euclid, Ptolemy and others thought that "light" was some sort of ray that travels from the eye to the observed object. The atomists and Aristotle assumed the reverse. Nearly 800 years after Ptolemy, circa 965 CE, in Basra in what is now Iraq, Abu Ali al-Hasan Ibn al-Haytham (Alhazen) settled the controversy with a clever argument. He said that if you look at the Sun for a long time you will burn your eyes: this is only possible if the light is coming from the Sun to our eyes, not vice versa. In 1672 another controversy erupted over the nature of light: Newton argued that light was some sort of a particle, so that light from the sun reaches the earth because these particles could travel through the vacuum. Hooke and Huygens argued that light was some sort of wave. In 1801 Thomas Young put the matter to experimental test by doing a double slit experiment for light. The result was an interference pattern. Thus, Newton was wrong: light is a wave. The figure shows an actual result from the double slit experiment for light. [Quantum scale particles and interactions should not be ruled out on this basis. Electrons (charged entities) or photons interacting with the charged atomic structure of the material bounding the slits they pass through, as well as to each other, should be deflected in such a manner as to result in what has been referred to as an interference pattern. The resultant pattern should be found to reflect the pulse repetition period of the photons of light. This is equivalent to what is seen as 'wavelength', as will be explained later in this paper. An electron gun, such as in a television picture tube, generates a beam of electrons. In this section we discuss how it works. These details are not important for our primary purpose here, so you may jump to the next section by clicking here. 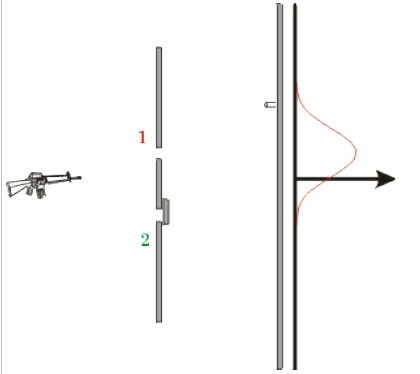 A diagram of an electron gun appears to the right. There are two vertical metal plates; the right hand plate has a small hole cut in it. A voltage source, indicated by V, maintains a voltage across the plates, with the left hand plate negative and the right hand plate positive. When a metal plate is heated, a process called thermionic emission literally boils electrons off the surface of the metal. Normally the electrons only make it a fraction of a millimeter away; this is because when the electron boiled off the surface of the metal, it left that part of the plate with a net positive electric charge which pulls the electron right back into the plate. In the figure, we are heating up the left hand plate so thermionic electrons will be boiled off the surface. But because of the voltage difference being maintained across the plate, electrons that boil off between the two plates do not fall back into the plate, but instead are attracted to the right hand positive plate. Most of the electrons crash into the positive plate, as shown. However, the electron in the middle would have crashed into the plate except that we have cut a hole in that part of it. So we get a beam of electrons out of this "electron gun." 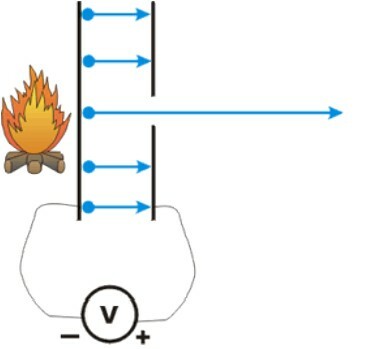 In real electron guns, such as at the back of a TV picture tube, the negative plate is not heated with a campfire as in our figure. Instead, a small filament of wire has a current passed through it. The filament heats up, glows red, and heats up the negative plate. You may have seen that red glow in the back of a TV picture tube. From now on we will put the electron gun in a black box, and represent the electron beam coming from it as shown to the right. In the previous section we discussed how to produce a beam of electrons from an electron gun. Here we place the electron gun inside a glass tube that has had all the air evacuated. The right hand glass screen has its inside coated with a phosphor that will produce a small burst of light when an electron strikes it. In a TV picture tube, for example, fields direct the beam of electrons to the desired location, the intensities of the electrons are varied depending on where we are steering the beam, and our minds and/or eyes interpret the flashes as the image we are seeing on the television. Now, "everybody knows" that electrons are particles. [Except when they are ‘known’ to be a vague cloud of probability surrounding an atomic nucleus.] They have a well defined mass, electric charge, etc. Some of those properties are listed to the right. Waves do not have well defined masses etc. Except, when we place two slits in the path of the electrons, as shown, on the screen we see an interference pattern! In fact, what we see on the screen looks identical to the double slit interference pattern for light that we saw earlier. If this seems very mysterious, you are not alone. Understanding what is going on here is in some sense equivalent to understanding Quantum Mechanics. I do not understand Quantum Mechanics. Feynman admitted that he never understood Quantum Mechanics. It may be true that nobody can understand Quantum Mechanics in the usual meaning of the word "understand." We will now extend our understanding of our lack of understanding. One possibility about the origins of the interference pattern is that the electrons going through the upper slit are somehow interacting with the electrons going through the lower slit. Note that we have no idea what such a mechanism could be [as we have overlooked the fact of charge effect at the atomic scale. ], but are a little desperate to understand what is going on here. We can explore this idea by slowing down the rate of electrons from the gun so that only one electron at a time is in the system. What we do is fire an electron, see where the flash of light occurs on the phosphor screen, wait a while for everything to settle down, then fire another electron, noting where it lands on the screen. We conclude that whatever is going on to cause the interference pattern does not involve two or more electrons interacting with each other. And yet, with one electron at a time in the system, with both slits open there are places on the screen where the electrons do not go, although with only one slit open some electrons do end up at that position. Now, to get an interference pattern we take a wave, split it up into two parts, send each part through one of the slits, and then recombine the waves. Does this mean that a single electron is somehow going through both slits at once? This too is amenable to experimental test. The result of doing the test turns out to be independent of the details of how the experiment is done, so we shall imagine a very simple arrangement: we place a light bulb behind the slits and look to see what is going on. Note that in a real experiment, the light bulb would have to be smaller than in the figure and tucked in more tightly behind the slits so that the electrons don't collide with it. We will see a small flash of light when an electron passes through the slits. What we see is that every electron is acting completely "normal": one-half the electrons are going through the upper slit, one-half are going through the lower slit, and which is going to be the case for a given electron appears to be random. A small (24k) gif animation of what we might see in this experiment may be seen here. But meanwhile, we have a colleague watching the flashes of light on the phosphor coated screen who says "Hey, the interference pattern has just gone away!" 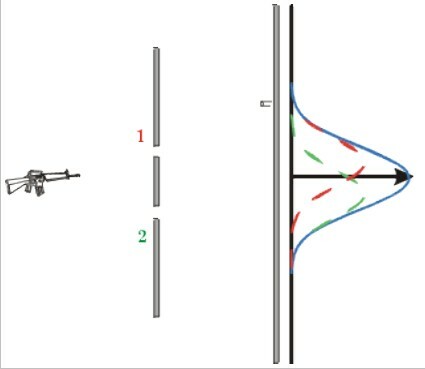 [because the very many photons used to detect the electrons also deflect their paths, thus nullifying, or at least altering the deflection paths caused by the atoms of the slit material] And in fact the distribution of electrons on the screen is now exactly the same as the distribution of machine gun bullets that we saw above. The figure to the right is what our colleague sees on the screen. Feynman on light interaction with electrons. Everyone has always known that doing any measurement on any system causes a disturbance in the system. The classical paradigm has been that at least in principle the disturbance can be minimised to the point that it is negligible. Is it possible to minimise the disturbance being caused by the light bulb? We can turn down the intensity of the light it is emitting. However, if we try it, just at the point that the light is getting so faint that we are missing some of the electrons, the interference pattern starts to come back! In fact, if the light intensity is, say, such that we are missing one-half of the electrons, we have one-half an interference pattern and one-half a particle distribution. So this attempt to minimise the disturbance didn't work out: we still don't know what is going on at the slits when we see the interference pattern. There is yet another way to minimise the disturbance. The light contains energy, and it turns out that if we increase the wavelength of the light, towards the infrared, the energy of each part of the light goes down. Perhaps if we decrease the energy in the light we won't be scattering it off the electrons so violently. [This is a mass/charge interaction event.] So, we start increasing the wavelength of the light emitted by the light bulb. We continue to see all the electrons, and at first we always see that one-half of them are going through the upper slit and one-half are going through the lower slit. A student once remarked that we should do a "better" experiment. The Heisenberg Uncertainty Principle says that such a better experiment does not exist. Einstein in particular devoted a lot of time trying to devise such a better measurement; all his attempts failed. The conclusion of all this is that there is no experiment that can tell us what the electrons are doing at the slits that does not also destroy the interference pattern. This seems to imply that there is no answer to the question of what is going on at the slits when we see the interference pattern. [because the wrong concepts are being considered.] The path of the electron from the electron gun to the screen is not knowable when we see the interference pattern. As Heisenberg said, "The path [of the electron] comes into existence only when we observe it." We will be discussing interpretations of what all this may mean in great detail later. For now I will briefly mention a "standard" if incomplete interpretation. If we think that the probability of where the electron is in space is a wave, then when we don't look the probability wave has two pieces at the slits, representing the fact that there is a 50% chance the electron went through the upper slit and a 50% chance it went through the lower slit. These two probability waves from the two slits, then, recombine at the screen and cause the interference pattern. When we look, we "collapse the state" in a 100% chance it went through one slit and a 0% chance it went through the other. And in this circumstance the two probability waves for the two slits cannot then recombine at the screen to cause an interference pattern: for each electron there is only one non-zero probability wave. Finally, then, we have two contradictory yet complementary models of the two-slit experiment for electrons. In one model the electron is a particle that somehow exhibits an interference pattern. [because of charge based deflections of the electrons (or photons) caused by their interaction with the dynamic atomic structure of the slit material.] In the other model, the electron is a wave that somehow manifests as a particle whenever we look at it. The text and images in this document are Copyright © 1998, 1999, 2001, 2005 David M. Harrison, Dept. of Physics, Univ. of Toronto, mailto:harrison@physics.utoronto.ca. This is $Revision: 1.20 $, $Date: 2006/03/15 13:16:45 $ (y/m/d UTC). The work contributed by Professor David M Harrison and modified within this document is licensed under the same Creative Commons License as noted above. This does not include the original work of Agonsco Ignis in this document or elsewhere. 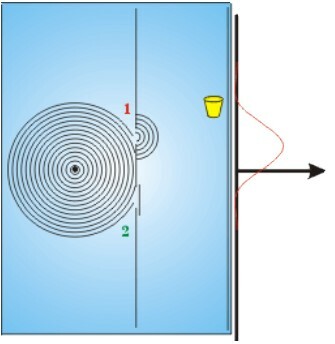 In their explanations of the Twin Slit Experiment, physicists describe the motion of objects such as bullets or tennis balls passing through slits in physical barriers. These things are not the equivalent of the photons or electrons in the actual experiment. There are two scientific reasons physicists are unable to perceive an alternative to a light-wave explanation for the outcome of the Twin Slit Experiment. A lack of consideration of the fundamental difference between events occurring at the macro and the micro levels of reality provides the first reason. The experiment itself does not deal with tennis balls or other macro objects bouncing off walls or passing through passive spaces provided by slits in these walls. Even in the case of a thin material in which the slits are cut, the path followed by a transiting negatively charged electron is bounded by the many highly mobile atoms making up the material by which it passes, atoms exhibiting the negative charge of their electron fields. Proportionally speaking, these rapidly moving atomic structures present very large and mobile repellent spheres to electrons passing in their vicinity. Electrons repelled by the negative charge of the electron fields of these atoms will have their subsequent paths affected by their angle of incidence with the curved electric fields of these atoms and by the relative motion of the atoms at that instant. In considering the foregoing description it can be seen that the various factors involved are readily subject to experimental variation to determine their precise influence upon results. The equivalent outcome for the Twin Slit Experiment when performed with either electrons or with photons of light allows the inference to be drawn that photons of light also exhibit a characteristic causing them to be repelled by the material of the slit by which they pass. In addition to the first oversight, failing to consider this behavioral equivalence factor provides the second reason physicists have thus far been unable to see beyond a wave explanation for the propagation of light. It should be clear that very many path-deflected electrons, as discussed, interact with a screen to form the patterns observed in this experiment. Physics has previously only been able to provide obscure explanations for how electrons [or photons] emitted from a source and passed through slits one-at-a-time eventually give rise to the same sort of pattern produced by a 'flood' of such particles. A little thought about the foregoing allows us to easily explain why 'interference patterns' produced by electrons [or photons] passing one at a time through the slits are not mysterious in any way. Each individually emitted electron or photon interacts with the mobile, curved negative charges of the atoms it encounters in the walls of the slits through which it passes. 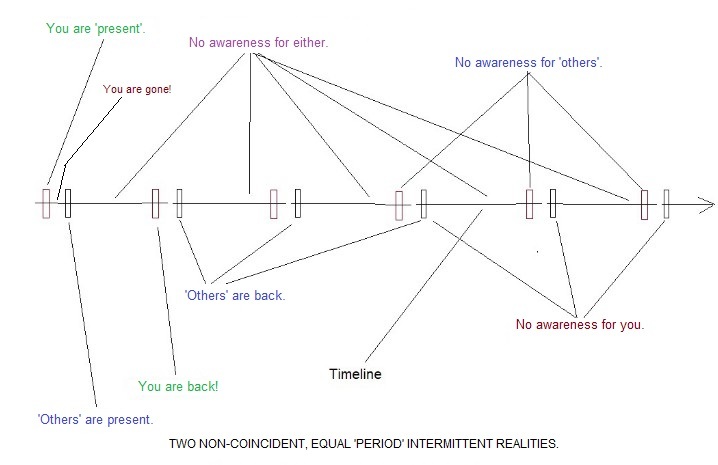 This interaction causes the deflection of the paths of these individual entities as previously discussed. Deflection of successive particles is thus able to gradually produce the results found on a screen able to store the accumulated pattern. No superposition of electrons or photons is necessary for this result to occur. It is not necessary for particles to travel back in time to interfere with themselves for the observed outcome to arise. A clear description of the exact mechanism involved in the proposed charged photon production of the light patterns produced by this and similar experiments is given above. It should also be clear that the accepted proof of the wave nature of light interpreted from this experiment is flawed. Professor Feynman was clearly aware of the flaws in the case he put forward here. He would have thought quite correctly, until now it would appear, that by pointing out the problems with his argument and then dismissing them they would not be further questioned owing to his reputation. 1. He claimed that it is clear that some medium is being ‘waved’ by light although he knew full well that light (EME in general) always travels in no substance at all. He knew that there is no aether and that photons travel between the atoms of matter. He knew this was true in the vacuum of outer space as well as in a gas such as ‘the air’, in a liquid such as water and in a solid such as glass. Feynman fully endorsed the opinion that electromagnetic energy has no mass, but even if it does possess the minute mass (and charge) I claim it to have, a photon would not influence the position of the atoms they encounter to produce ‘waves’ in the air or any other medium owing to the vast mass differential. On the contrary, it is such encounters with the atoms of the slit material that cause the distribution of light on the back screen in these experiments. 2. Feynman said that there is no problem regarding conservation of energy in the case of anti-phase waves as the energy of two waves that are 180 degrees out of phase with each other is ‘rearranged’ in a manner that conserves their energy. While this claim may be valid for waves in material substances where they exist as forces influencing the physical distribution of matter, it does not apply to photons. As photons exist as packets of energy only and they travel in no medium at all, there is no possible rearrangement of any thing (material) that will conserve their energy if they cancel each other out. If such ‘waves of light’ canceled each other as claimed, their energy would simply be gone. This impossibility reveals that it is invalid to view light as a ‘wave’. 3. 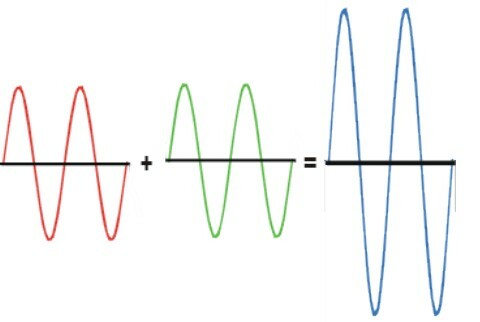 Feynman also claimed that waves (of the same ‘frequency’) that are in phase with each other combine to produce a wave of their combined amplitudes. Once again, such an idea is valid for waves in physical materials but if indeed photons combined as suggested however, they would produce a new photon of their combined energy and this entity would exist at double the frequency of its constituents, not double their amplitude. As pointed out earlier, if this happened for a photon of visible light the new photon would be outside the visible spectrum. To be more precise, when doubled in this manner the lowest visible red light frequency would be at the extreme limit of visibility in the violet range. Any other frequency would disappear from human sight. 4. Feynman and all others accepting this incorrect interpretation of the twin slit experimental results completely overlook the nature of matter at the atomic scale and as a consequence they misunderstand what is actually happening, both in the experiment itself, and as a result, in reality in general. This error probably contributed more than anything else to a continued inability to understand concepts such as ‘heat’ and the mechanisms of its interaction with matter. Quantum physicists then compounded their adoption of the wrong format for light by concocting invalid explanations in support of the view of reality they had chosen. Many questions in physics can be answered with the assumption that photons possess mass and charge. Additional puzzles reveal their solutions if it is also viewed that the mass and charge of a photon varies with time and at a rate determined by its energy content, as proposed in my hypothesis. The idea I describe finally allows the valid application of the term Quantum Mechanics to the branch of physics dealing with the very small as we are now able to visualize and create diagrams for what is actually taking place in the amazingly complex interplay of forces surrounding us. A clear understanding of the concept I put forward discloses that there is in fact no separation between the micro and macro worlds. It is all a continuum lacking the long-sought transitional stage considered by many to exist. All ‘material’ interaction takes place between the entities of the micro world and their instantaneous relationships are manifest to us at the macro level. Why has this been so difficult to see? ""According to the eminent physicist Richard Feynman, the quantum double-slit experiment puts us "up against the paradoxes and mysteries and peculiarities of nature". By Feynman's logic, if we could understand what is going on in this deceptively simple experiment, we would penetrate to the heart of quantum theory - and perhaps all its puzzles would dissolve." Philip Ball in his review of Through Two Doors at Once by Anil Ananthaswamy. In Through Two Doors......, ""Ananthaswamy concludes that "physics has yet to complete its passage through the double-slit experiment. The case remains unsolved."" Charged entities attract or repel each other. Photons influence the path of electrons. For photons to influence the path of electrons they must possess mass and some means of interacting with them. It is proposed that photons also possess charge, which provides a means of interaction with other charged entities. Charged photons are attracted to or repelled by other charged entities. The directional consequences for charged entities encountering each other are determined by their charges and angles of incidence. Atoms present a (relatively) very large, massive and mobile (thermal activity) ‘charge curve’ to electrons or photons encountering them. The mass and charge of photons is far below any quantities previously considered for any ‘thing’ and their interaction with other charged entities is modulated by these instantaneous and constantly cycling values as described in the following hypothesis. 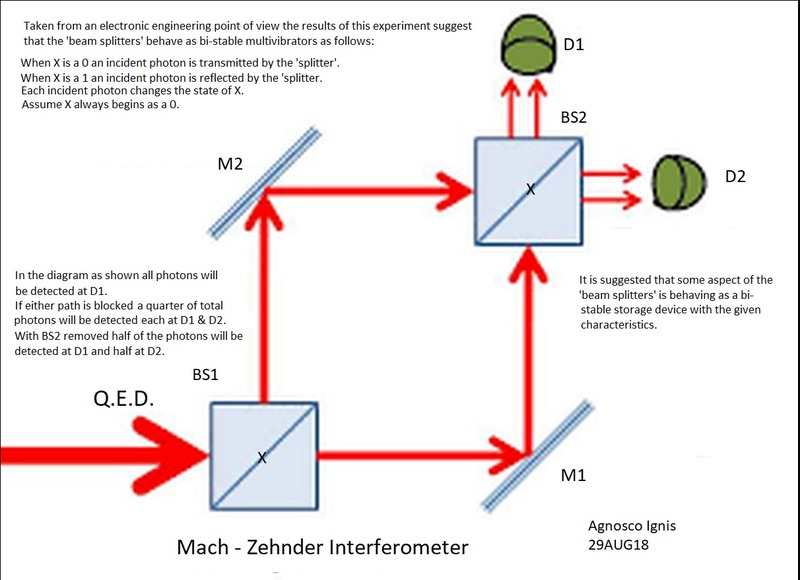 A more sophisticated experiment considered to show the same interference between photons as that perceived in the Twin-Slit Experiment is called the Mach-Zehnder Interferometer. Theoretical physics makes interesting claims regarding what is happening in this experiment and these may arise due to a misunderstanding. 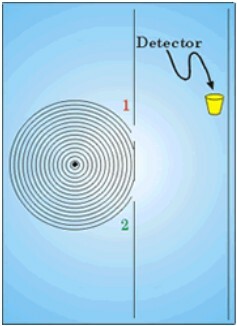 Analyzing the outcomes for this experiment as described in the excellent book Through Two Doors At Once by Anil Ananthaswamy, one is able to see the results as identical to those that would occur if the 'beam splitters' employed behaved as if they were single bit storage and dividing devices such as the bi-stable multivibrators used in electronics. Since the original discrete transistor flip-flops employed extensively in early electronic circuits, many devices and techniques have been utilized for the storage of data using a wide range of components from magnetic tape to high impedance charge storage 'capacitors'. Far more sophisticated forms of data storage are in use and others are under development but that is a complete field of study on its own. The following diagram illustrates the concept of bi-stable multivibrators substituted for the beam splitters of the Mach - Zehender experiment. It can be seen that a direct comparison appears possible as the outcome is identical to that actually observed in the experiment. It should also be clear that inserting the second multivibrator [beam splitter] after the emission of a photon as in John Wheeler's delayed choice modification to this experiment would not impact its outcome - as has been discovered, but with physicists invoking interpretations requiring strange and unnecessary concepts. In this experiment single photons are emitted from the source using technology developed by Professor Alain Aspect. Rather than proving that light is a wave that interferes constructively and destructively to produce a brighter [doubled] output and a darker [nul] output this experiment shows that the results found can be produced by light particles producing and removing charged regions in what are referred to as 'beam splitters'. It was previously explained that waves of light, if they existed, could not interfere with each other as claimed by Feynman and others. A modification to the foundations of physics is indeed possible without having the whole thing collapse around us. Please explore with me what may be the ‘missing link’ between the micro entities of the quantum world and the ‘material reality’ we see around us. In my view, Quantum Mechanics is quite compatible with ‘cause & effect’ as will be outlined herein but has been led astray by an assumption of uncertainty. Intense analysis of the consequences of uncertainty has created a magical interlinked web of scientific hypothesis, much of it little better than speculation that is frequently referred to as ‘theory’. ‘’If we’d been born where they were born and taught what they were taught, we would believe what they believe.’--‘A sign inside a church in Northern Ireland, explaining the origin of intolerance and hate" –but it works just as well for entrenched scientific beliefs. Neutrinos were at one time considered to possess zero mass and zero charge. It is now ‘known’ that they indeed have very small mass but no charge. The concept of ‘neutrino charge’ will be addressed later in this document. It is proposed here that, lacking detectable charge, neutrinos are able to pass freely between the atoms of material things as they do not interact with the charged components of these atoms. Neutrinos are of course able to pass through the entire Earth almost as if it were not present at all. In a recorded lecture, Professor Richard Feynman discussed the reflection of light from ‘surfaces’ such as that of glass. Rejecting the alternate view of ‘waves’ at that time, Feynman considered photons to be particles and indeed particles lacking either mass or charge. He said that when a photon encountered matter is was absorbed by an atom which 'shook it all about' before emitting it as a new photon and that photons were not in fact reflected. He was unable to explain the behavior of photons within matter in any descriptive manner, so he claimed that such an explanation was impossible, and that we can only put the percentage ‘reflection’ results found in experiment down to ‘probabilities’. In the search for a unified theory of physics at all scales, “we could easily be kept on the wrong track for a long time by restricting ourselves to the usual interpretation of quantum theory,” Bohm wrote. What aspects of a photon cause it to interact with atoms in such a manner as to cause its 'reflection' or re-emission then? This was not addressed in the Feynman lectures. Neutrinos do not reflect, perhaps because they possess no charge. We ‘know’ that photons also have no charge though, don’t we? Could it be that photons interact with atoms because they do indeed possess a charge but that this charge is so insignificant that it is undetectable by any means so far used? Is it possible that for almost inconceivably brief periods of time they do have sufficient charge to permit them to interact with atoms? Please consider the following hypothetical mechanism by which photons may acquire interactively significant charge for incredibly brief fractions of time and exist as particles possessing incredibly minute mass and an incredibly small charge for periods too short for charge or mass deflection to be detected at ‘normal’ scales. What do we actually ‘know’ about the photon and its mode of propagation? Perhaps we have relied too heavily upon one or two invalid suppositions along the way? What evidence do we have, I mean real evidence that the photon is ‘always’ a particle and a wave ‘simultaneously’? Or even either ‘always a particle’ or ‘always a wave’ as some assert? The analysis of The Feynman Double Slit Experiment at the beginning of this paper suggests that all consideration of a wave nature for light should be abandoned in the absence of other compelling evidence in its favor. Taking the whimsical view that we have at some time in the past fallen through the looking glass and down the rabbit hole where we encountered many strange and wonderful things, I’d like to take the return journey to Alice’s bedroom, leaving behind the disembodied grin of the Cheshire cat and all the other wonderful products of a vivid imagination. It is my contention that current paradigms surrounding subjects such as electron theory provide no explanation for observed results.. It is also my contention that the ideas about the photon contained in these pages provide far more precise agreement with experiment than others currently subscribed to, and that they give a logical explanation for known behavior..
It’s time to re-examine current thinking in this area. “Nevertheless, I am confident that the truth will come out and Common Sense Science will prevail as valid science. I have no ideas how long it will take, or how many will come to accept the scientific truth that modern physics must be replaced (not reformed).” (30 July 2002)..
Hypothesis: A tentative insight into the natural world; a concept that is not yet verified but that if true would explain certain facts or phenomena. Once again, please understand that many current ‘theories’ are, at best, hypotheses and at worst mere speculation.. I do understand that the fundamentals discussed here are argued otherwise in current teaching. However, is reality as complicated as we have come to believe?. If the hypothesis presented herein [or some variant] is valid, an understanding of it will provide quite apparent explanations for many of the mysteries of science. Several of these explanations are given in some detail after the concept is described below. Be advised that the ideas presented in this publication have not yet been reviewed..
Encouraged by statements made by The Skeptics Society [ http://www.skeptic.com ] regarding their method and philosophy and wishing to expose the ideas presented in this article to a reasoned critical analysis, the [https://www.hereticalphysics.com] site has been referred to the Society’s Executive Director, Dr. Michael Shermer..
A similar submission has been made to The Committee for Skeptical Inquiry [https://www.csicop.org ] as this site also claims impartial logical analysis of controversial ideas. A copy of these emails is available on the hereticalphysics site here..Please read them bofore continuing. Replies have not yet been received despite follow-up emails sent on the 5th of June 2016 advising that the previous emails to the two editors are now included in the website. With conventional understanding set aside for a moment, please consider what follows with an open mind. What sets the limit to the speed of ‘something’ propelled through space? The speed of a bullet fired in intergalactic space is determined by the mass of the projectile and the force of the explosion propelling it from the barrel of the gun. In the case of our bullet, propelling a projectile of greater mass with the same or lesser force results in a lower speed, with the speed being determined by the relationship between these two factors. The rate of acceleration is also dependent upon these same things.. When an atom emits a photon, what determines its speed of emission? Some may reply that ‘c’ determines this speed but isn’t it the case that ‘c’ merely designates the known speed limit, that is, a known [measured] number of meters per second that ‘light’ travels and above which it is theorized [and seemingly demonstrated] that nothing may travel? But why is this the case? What aspects of ‘a thing’ prevent infinite speed in space?. The answer to this question may in fact be: ‘Its mass and the force propelling it’, even in the case of a photon..
For the purposes of the concept under discussion it is taken that the mass of an emitted photon is instantaneously almost but not quite zero at the time of emission..
With nearly zero mass, even the most minute of accelerating forces would, in theory, propel an emitted photon rapidly toward an almost infinite speed. We know that such a speed is not attained, with the ‘known’ ‘speed limit’ being approximately 300,000 Km per second. But why is this a speed limit for photons? To my knowledge no reasonable explanation for this has been proposed by science. .“Current Problems Cannot Be Solved With Current Thinking. In 1905, Einstein published a paper, "Concerning an Heuristic Point of View Toward the Emission and Transformation of Light," in which he envisioned light travelling not as a wave, but as some manner of "energy quanta." This packet of energy, Einstein suggested, could "be absorbed or generated only as a whole," specifically when an atom "jumps" between quantized vibration rates. A photon, when emitted, exists as a packet of energy that has a finite but immeasurably small mass. The force propelling an emitted photon is determined by the energy of the photon. The higher the energy level of a photon the greater its rate of acceleration. The speed of such an accelerated packet of energy increases rapidly toward an almost infinite target speed, acquiring an inertial mass increase commensurate with its speed. As the speed of an emitted photon approaches a fundamental limit [currently considered to be about 300,000 Km per second] the rate of photon inertial mass gain increases very rapidly, until, at the fundamental limit, there is insufficient energy for further mass acceleration. Further, as the speed of the photon approaches the fundamental speed limit the photon progressively materializes as a minute physical particle possessing increasing inertial mass and with increasingly negative charge while its time rate [relative to an observer] approaches zero. During the final stage in this process all of the energy of the photon is exhibited as mass possessing a negative charge. At this point the photon ‘pivots’ on the verge of a zero-time, zero-motion condition in which its inertial mass and the associated kinetic energy once again exhibit as electromagnetic energy accelerating as if newly emitted from an atomic structure.. The described process repeats in the form of successive transitions between the energetic and material states of the photon and this oscillation occurs at a rate determined by the energy content of the photon, with a high energy photon transitioning at a higher ‘frequency’ [repetition rate] than that of a low energy photon..
A lower frequency [lower energy] photon therefore goes through less transitions in a given period of time than a higher ‘frequency’ photon and, being at a lower energy level, its rate of acceleration will also be less than that of a higher energy photon, thus it is anticipated to spend more time as a materializing particle before reaching the speed where it transitions to its next energy phase..
Photons of higher energy content initially accelerate more rapidly than those of lower energy but as they approach the fundamental limit sooner, they are in addition subjected to greater mass effects resulting in a rapid reduction in their rate of acceleration in the latter stages of their cycle, giving rise to equal overall average speed. A 1GHz photon, for example, will pass through two energy/mass transitions during the time that a 500MHz photon does so once but the average propagation speed remains the same for each.. If the foregoing is correct, an implication is that ‘c’, as the measured speed of electromagnetic radiation, is really the average of the speeds attained throughout the cycle and that the maximum speed of the photon is in fact higher than 300,000 Km per second. Macro-level measurement is of course unable to detect this speed variation of photons as their detection is only possible in the latter period of their cycle when they exhibit sufficient mass and charge to interact with the material substance of our measuring equipment.. The form in which electromagnetic radiation [a photon of light for example] exists at any instant depends upon the precise time within a cycle of oscillation. It is evident from this discussion that while each propagating photon appears in reality to have a continuous stream of existence its occurrence in either of its major forms [energy or matter] can perhaps be viewed as quantised, leaving the impression that ‘light’ propagates as a series of discrete packets. No photon of electromagnetic energy may continue to accelerate beyond the speed at which its energy is entirely exhibited as ‘mass’. This has been found to occur at the same speed [over macro distances] for all energy levels [frequencies]. This is the ‘speed of light’. It has been hypothesized and to this time found to be the case that no form of energy may exceed the speed of ‘light’. All matter is known to consist entirely of energy. It is proposed that all forms of energy, whether they be the ‘photons’ forming electrons as described in a later section of this article or those entities speculated by this author to comprise the protons and neutrons of an atom’s nucleus, oscillate continuously between the described material and energy conditions. It should thus be clear that no material thing may exceed the speed beyond that of propagating energy. A material thing of course comprises a vastly complex system of such relationships between non-identical ‘on again, off again’ motes of matter and it is the aggregate of these relationships that presents us with the material world around us and also with that world’s progress through time. Photons approach a material object at ‘the speed of light’. A photon approaching a material object will be influenced by the negative charge presented by an electron field of any molecule encountered to a degree determined by the charge exhibited by the photon at the time of the encounter..
A photon encountering a molecule of matter during the photon’s electromagnetic phase and therefore lacking significant charge will not be repelled by the molecule but will instead either pass by the molecule and enter the inter-molecular space beyond, thus becoming part of the thermal load of the matter involved or, if of an appropriate wavelength, may be captured within the virtual wave-guide of the electron shell [discussed in a later section]. Energy captured in such a manner may subsequently be emitted by the atom as a photon..
A photon that enters the inter-molecular space of matter during its electromagnetic phase will continue to accelerate until it gains significant mass and charge in its material phase, at which time its path will be deviated by repulsion from the electron field or attraction toward the nucleus of any adjacent atom depending upon its location within the atomic structure at the time of its materialization. Mass and charge shedding in any following electromagnetic phase may free the photon to continue on its new path. Successive mass/charge phases will cause successive path deviations, causing the photon to ‘bounce around’ within the material substance. Mutual repulsion between materialized photons will enhance this activity.. Such additions of energy to matter are detectable as a temperature rise and the ‘thermal agitation’ of the molecules of the matter results in physical expansion. Thus the ‘random’ motion of molecules in an object, rather than being the ‘heat’ of the material thing, is the result of photon ‘collisions’. The ‘heat’ of matter represents its ‘free’ photon content. In this hypothetical model the electron surrounding the nucleus of a hydrogen atom [for example] exists as a cloud of equal period photons cycling individually between their energy and matter forms at a radius determined by their period of oscillation between states..
[Note that the photons comprising an electron do not meld into a single energy packet that ' orbits' the nucleus in the form of many cycles of the ‘electron’ frequency but continue to ‘circulate’ as photons at the absorbed ‘resonant frequency’.]. The cloud of photons remains captivated by the atom owing to the negative charge exhibited by the photons when in the particle mode being attracted to the positive charge of the nucleus. This concept will be clarified further in a later section. ‘Orbital’ electron mass results from the sum of the masses of its constituent particulate photons..
‘Orbital’ electron charge arises from the sum of charges presented by the material occurrences of the photons of which it is comprised..
Photons cycle through the electromagnetic and particulate states as described previously and at a rate determined by their energy content..
An electron virtual tuned cavity is able to absorb photons at its resonant frequency up to the point of saturation. Electrons of most atoms with which we are familiar will rarely be in this condition owing to the ongoing absorption and emission of photons as they exist in an environment rich with photon [energy] sources.. When an electron is saturated, it is suggested that absorption of an additional incident photon corresponding to the wavelength of the wave-guide formed at its resonant frequency causes the electron to enter an over-energized condition requiring re-balancing of the forces distributed within the photonic cloud.. This redistribution of energies results in the electron transiting to the next energy band [for example from n1 to n2], an unstable condition generally leading to the subsequent emission of a photon and a return to the lower energy band. Prior to the point of saturation the photons within an electron exist in a state of dynamic tension between each other caused by the mutual repulsion of their negative charges when in their material phases. In the absence of other influences this repulsion will maintain an even distribution of materialized photons around the nucleus of the atom. This even distribution is seen as occurring through the particulate forms moving slightly away from each other under mutual repulsion before reverting to the energetic state. The degree of tension between photons increases with the addition of each additional photon and causes a redistribution of all of the photons comprising the electron in such a manner as to maintain a balance between the forces involved.. This process continues with the absorption of additional photons until the repulsive forces among the photons overcome the attractive force of the nucleus, at which point the energies within the electron are redistributed into photons of a ' wavelength' that causes their orbital radius to increase to a point where the balance between attractive and repulsive forces is restored. This occurs with a greater spatial separation between the photons’ material phases due to their lower 'frequency' [longer wavelength] and the resultant increased circumference of their 'orbit'.. The electron in question is at this point unable to absorb further photons of n1 energy but may absorb photons of a wavelength equal to its new, lower 'frequency', resonant energy..
Energy levels above n1 are unstable as, with photon material states more widely distributed, the repulsive force between them is only marginally able to overwhelm the attraction of the nucleus and a tendency exists for the electron to return to the n1 orbital.. If there is no incident energy [no absorbed photons] at the wavelength of the virtual wave-guide at the new orbital radius the electron will emit a packet of energy at the n1 frequency and return to the stable saturated state at n1 with the energy redistributed once again into n1 frequency packets..
During the period in which the electron existed at the higher energy level, n2 for example, [before emission of a photon] it may absorb photons resonant with its new, lower 'frequency' and may continue to do so until the saturation level of that shell is exceeded by the addition of a photon causing that shell to overcome nucleus attraction and transition once again to a higher energy orbit such as n3.. Note that even though the photons ‘circulating’ within the electron in the n3 orbit are, at this stage, individually of a lower energy [lower 'frequency', longer 'wavelength'] than those at either n1 or n2 their combined energy is greater than the combined energy in the lower orbits by the sum of the energies added by all the photons incorporated above the saturation levels of n1 and n2.. Note also that when the electron transited to the n2 orbit from the n1 orbit, it did so in an unsaturated state for that orbit owing to the degree of separation of the photons within it and the same unsaturated condition exists for all electrons transiting to higher energy levels. A number of, probably very many, additional photons will need to be absorbed by the electron at each level before this level becomes saturated and able to transit to a yet higher energy level [n4 for example] with the addition of one more photon.. When initially within the n3 orbit, the electron is in an unstable condition owing to the wide distribution of charge carriers within it [as in the n2 level] and is prone to collapse back to a lower level, perhaps as far as the n1 level but this will not occur if the electron is subjected to sufficient incident radiation at a frequency resonant with the n3 orbit. Such additions of energy will drive the electron toward saturation at that level, with the potential to elevate it to a higher energy orbit once again.. If no, or insufficient energy is added to the electron while at the n3 level, the wide distribution of photons within it will result in a collapse of the electron back to a lower level, and if this is the n1 level, in the process it will emit a single photon with an energy equal to that of the sum of the photon energies that had promoted the electron from the n1 energy level to the n3 energy level.. The process described above is identical for all energy levels of an electron with the exception that at some radial distance from the nucleus the addition of a photon to a final saturated n-level will drive the electron to a radial distance at which the attraction holding the photons captive to the nucleus will be insufficient to retain them and the electron will be released as a negative ion comprising the mass and charge of all of its constituent photons.. This explains how a single photon with tiny momentum compared with that of an electron causes the release of an ‘electron’ in the photoelectric effect. This ‘free electron’ is a photon with the sum of the energies of n1 and all additional incident photons that promoted the ‘electron’ to the release level. Such an entity possesses far greater energy than many other photons within the molecular structure of the material involved. It therefore also presents a relatively greater mass in its particulate form and if not ‘directed’ by an applied emf will add significantly to ‘thermal’ effects.. Please note that at any time during which any electron of an atom is in an unsaturated condition the atom will possess some residual degree of positive charge as the charge of its protons is not fully offset. This could be seen as the normal condition for most atoms present in an energy rich environment, or perhaps in any environment.. It should now be seen that when a photon approaches an atom it may only be reflected if it is presenting as a negative field at the time it encounters a negative presenting photon [or photons] in an electron of an atom either at or beneath the material’s ‘surface’. The angle of reflection will result from the instantaneous arrangement of negative state photons in the electron when encountered by the approaching photon. Consider a hydrogen atom for example, present in an environment where its electron receives no incident energy at a wavelength equal to its resonant frequency.. Such an atom will be in a stable state with its electron being saturated, less than saturated or not present at all [the atom is a positive ion].. In each of the above possible conditions the atom exists as an elemental particle of matter with intrinsic characteristics the same as those of any other hydrogen atom in the universe.. It is suggested that such atoms would exist normally as either positive ions or would have unsaturated electrons.. The group behavior of these atoms would be entirely different for these two conditions..
As positive ions, it can be seen that the repulsive force acting between them will cause unconstrained atoms in this form to rapidly disperse.. Atoms possessing unsaturated electrons on the other hand will collect together under the influence of the gravitational force.. In aggregate, vast but distant clouds of such atoms will exhibit gravitational effects detectable by astronomers through their affect upon other matter. Such clouds may consist of any elements or compounds meeting the conditions described..
Aside from their gravitational effects however, such clouds of matter would otherwise be totally invisible as they emit no energy.. It is suggested that this is Dark Matter. Read on – only if you truly have an open mind. Einstein was found to be correct when he said that the path of light would be curved as it passed a massive body such as a star. To explain this outcome he proposed the idea of 'space-time' and said this entity is distorted or curved by the presence of mass, thus causing photons of light traveling in a straight line within a curved space-time to follow a curved path. Of recent times, support for the concept of space-time has declined among scientists, with eminent physicists such as Professor Nima Arkani-Hamed of Princeton University questioning its existence. Professor Arkani-Hamed on Gravitational Lensing & Quantum Mechanics. It has been clearly demonstrated that the path of light is indeed curved in its passage by objects of considerable mass and this effect, known as gravitational lensing, has been used as a tool in the work of astronomers. However, if there is no such thing as space-time to alter the path of light it becomes necessary to find an alternate explanation for the observed phenomenon. As has been discussed earlier in this paper in the case of the Twin Slit experiment, fundamental errors in today's science have arisen from a misinterpretation of the meaning of experimental results. While there is no doubt about the effects observed in the slit experiments or in those demonstrating the curvature of the path of light under the influence of a large mass, in both instances erroneous assumptions have been made regarding the causes of those outcomes. Does this require further explanation following previous discussion of ‘thermal’ photons? Any reader who prefers to live in a universe of mystery and illusion should read no further. The following corollaries of The Speed of Light hypothesis address aspects of science that may, by many, be considered to be forbidden zones. Should you decide to continue, please do not be disappointed by the simplicity of what may be the truth about reality. Knowledge is only the first step toward understanding. What follows is truly only for the ‘clear-eyed seeker of wisdom and truth’. Anyone reading on may be disillusioned in the sense that what they have been led to believe regarding major mysterious aspects of the universe will have an exotic veil torn away from their eyes, revealing a reality that may to them appear to be depressingly mundane. In truth, a clearer understanding of the mechanisms of energy and matter can only enhance man’s ability to ‘control nature’. In the electron model hypothesized in this article it can be seen that atoms would normally present a residual positive charge owing to a deficit of photons in any of their electrons that are not in a saturated condition. This residual positive charge will exert a very weak attractive force upon the electrons of other matter and the strength of this force will depend upon the extent of photon vacancies within their electrons and the distance between the entities. The remaining un-neutralized residue of each atom’s positive electric field may in fact be responsible for the phenomenon known as gravity. If this is so, it can thus be seen that gravity is a quantized phenomenon. Although this is of course still the electric force, which is considered to be the ‘strong’ force, in this view of gravity we are looking at a small component only of this force, hence the relative weakness of the attraction involved. “Suppose that we have two unlikes that attract each other, a plus and a minus, and that they stick very close together. Suppose we have another charge some distance away. Would it feel any attraction? It would feel practically none, because if the first two are equal in size, the attraction for the one and the repulsion for the other balance out. Therefore there is very little force at any appreciable distance. The above quote illustrates how a small deficit of photons in an ‘electron’ can cause the ‘weak’ force known as gravity. It may be read as agreeing that ‘gravity’ is equivalent to an uncanceled very small residue of electrical charge. There exist at least two instances where the ‘gravitational’ attractive force is far stronger than otherwise, although these have not previously been seen as the same force as gravitation. 1. An aspect of the above is recognized in the concept of electrostatic bonding of atoms - which can be considered a special case of gravitational attraction [where, in the model of the electron presented in this paper, photons have been ‘eroded’ from the outer electron shell, thus making the atomic residual charge slightly more positive than otherwise]. 2. Covalent bonding can also be seen as a distinct example of the same forces at work. Here, the incomplete outer shell of the atoms presents an even more positive field to the electrons of surrounding atoms, thereby forming a stronger attraction and bond than in the ‘electrostatic’ example. There remains a third, very interesting instance mentioned earlier where a gravitational field may be stronger, perhaps far stronger, than that normally observed. While it is plain that the nearer to the point of saturation the electrons of the atoms in a field of Dark Matter are, the less will be the residual positive charge and the less will be the degree of attraction between their atoms, it can be seen that to a degree the opposite is also the case. The possibility exists for atoms of such matter to exert a considerably stronger gravitational attraction toward each other than the matter with which we are more familiar. If the degree of photon deficiency of their electrons is greater than that of ‘normal’ matter, that is, matter exposed to a continual interchange of photons, they will exert a greater ‘gravitational’ attraction upon all matter in the universe, presenting a force equivalent to that ‘normally’ provided by more ‘massive’ atoms. Thus this expression of the electric force of attraction may more closely resemble what has been known as the ‘strong’ force. It is known that the emission of a photon imparts thrust upon the emitting body in a reaction to the emission. It is also known that a photon imparts thrust to a body it encounters. The repetition frequency of a photon emitted from a stationary body is determined by the energy of the photon on emission. The process determining this emitted energy is outlined elsewhere in “The Speed of Light” and will depend upon the origin of the photon as stated in Note: 3. For a stimulated atom it will depend upon factors such as the chemical element emitting the photon, its specific emitting ‘electron’ configuration [as proposed in The Speed of Light] immediately prior to emission and the frequency and exact timing of incident photonic energy. Equal thrust from the photon emission process is applied to the emitting atom [and by extension, the body of matter containing it] and the photon itself, indicating that half of the photon energy has been expended in applying an accelerating force to each entity. Should the emitting body be in motion at the time of emission, the direction of this motion with respect to the direction of photon emission will determine whether energy is added to, subtracted from or has no impact upon that potentially comprising the photon. An emitting body moving in the same direction as the photon will add energy to the photon [increasing its frequency]. This emission and transfer of energy will slightly oppose the speed of the emitting body - a minute decelerating force will be applied. An emitting body moving in a direction opposite to the direction of photon emission will subtract from the energy of the photon [reducing its frequency], with the emission and transfer of energy serving to slightly add to the speed of the emitting body - a minute accelerating force will be applied. An emitting body moving orthogonally to photon emission direction will neither add to nor subtract from photonic energy. Therefore, by adding to or subtracting from the energy of an emitted photon the motion of the emitting body causes the frequency of the photon to differ from an equivalent photon emitted from a stationary body. Photon limiting speed remains that at which all available energy is exhibited as mass and this is identical for photons of any energy content. ‘Launching’ a photon from a fast-moving source alters the photon’s energy and therefore its rate of acceleration toward the speed limit but there is no change in the ultimate speed of the entity itself. Average speed is identical for photons of all energy levels. What differs is the period of time taken to attain the speed limit. This determines the repetition rate, or frequency of the photon. If the foregoing is correct, this means that the energy [frequency] of photons emitted from a body in motion and from a body at rest differ intrinsically and irrespective of an observer. If so, this would seem to undermine any claim that all motion is relative. Also if the foregoing is correct it explains why the speed of ‘light’ is independent of the speed of the source and that of the observer, an effect that science has accepted as a fact without offering any explanation. There is no magic, only phenomenon we are as yet unable to understand. In a thought experiment, consider a Universe where only one body was in existence, that body was emitting equivalent photons in all directions and was also ‘in motion’. Even under such circumstances it can be seen that locations behind and ahead of the body in its path would receive different photon frequencies indicative of motion. The foregoing, if true, means that movement of an object [in space for example] and the speed at which it travels are aspects of the object in and of itself. No reference to any other body is necessary. There is also no requirement for a ‘frame of reference’ for this to be so. The motion of a second body moving relative to the previously discussed body will alter the energy [frequency] of photons received from the first body. A relative closing speed will add to the energy of such photons and an opening speed will subtract from this energy. If body ‘one’ is moving away from a stationary body ‘two’, body ‘two’ will received energy from body ‘one’ that has been reduced at emission due to the intrinsic movement of body ‘one’. This is the detected ‘red shift’. If body ‘two’ is also intrinsically moving and is doing so away from body ‘one’ this will further reduce the energy received at body ‘two’. That is, a ‘red shift’ caused by the motion of body ‘one’ will be increased by the motion of body ‘two’. The reverse is of course true if body ‘one’ is approaching a body ‘two’ that is also moving to reduce the distance between them. Such motion will be detected as an increase in energy [frequency] and therefore a ‘blue shift’ in the received photons. If body ‘one’ is moving away from body ‘two’ the ‘red shift’ produced by this motion will be increased or decreased depending upon whether the motion of body ‘two’ is causing body ‘two’ to ‘catch up with’ body ‘one’ or to fall further behind it. Intrinsic red or blue shifts caused by the motion of body ‘one’ may therefore be increased, decreased or even eliminated and possibly reversed by the motion of body ‘two’. The idea that space itself is expanding would seem to be a necessary concept to explain the prevailing view that electromagnetic radiation propagates as a wave and that the hypothesized expansion of space stretches these hypothesized waveforms, thereby reducing their frequency and resulting in the observed Red Shift. As the ‘frequency’ of a photon results directly from the energy it contains, such a process would entail an unexplained removal of energy from the photons involved. If electromagnetic propagation occurs as hypothesized in The Speed of Light then no ‘waveform’ propagates in space and any expansion of the hypothesized medium of space would merely result in additional photon transitions over the increased distance but there would be no change in frequency. Assuming that the universe is indeed expanding at an increasing rate as claimed, what other explanation could there be for an increasing Red Shift other than an accelerating expansion of space itself?. Should the emitting body be in motion at the time of emission, the direction of this motion with respect to the direction of photon emission will determine whether energy is added to, subtracted from or has no impact upon the energy comprising the photon..
An equivalent concept applies to the energy content of photons detected at a body approaching or receding from their source. If the detecting body [the receiver] is approaching the source of the photons its motion in that direction will add to the energy of the photon as detected and it will therefore occur at an increased frequency [the photon will also apply thrust in opposition to the motion of the body]. Conversely, if the detecting body is receding from the source some of the energy of the photon will be transferred to thrust in the direction of travel of the body thus decreasing the detected frequency of the photon.. Consider what we understand about the force we call ‘gravity’.. Imagine ‘the universe’, or that portion of matter and energy [including dark matter] of which we are aware, as a relatively tiny bubble of energetic matter enclosed within a vast mass of matter that exists beyond our Light Horizon. This mass is quite separate from the dark matter detected through its gravitational effects within ‘our’ ‘universe’ and may only be ‘invisible’ because it exists beyond our light horizon. See Figure 1. below. 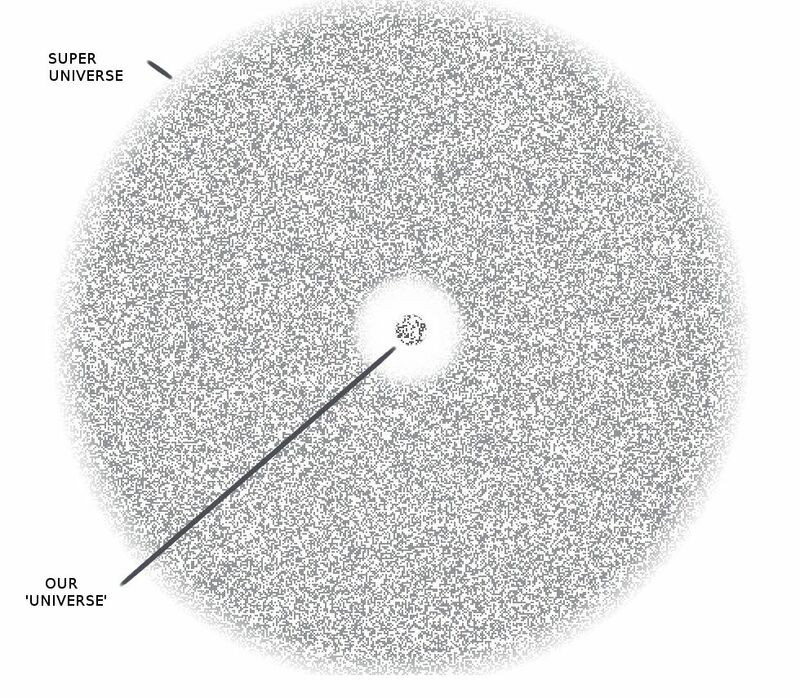 Note that the image is not intended to suggest a finite spherical extent for the Super Universe depicted. In this concept, the matter of our ‘universe’ is being attracted ‘outward’ toward the matter of the surrounding ‘super universe’ and the ‘super universe’ ‘inner surface’ is ‘collapsing’ toward us. The ‘edge’ of our universe depicted represents our Light Horizon. The spherical inner ‘surface’ of the unseen matter enclosing ‘the universe’ may or may not be at some considerable distance from the ‘boundaries’ of our universe as set by our light horizon. Interaction between the ‘normal’ matter of ‘our universe’ and the unseen matter of the surrounding ‘super universe’ is in accordance with that between all ‘normal’ material things in that they attract each other. As the distance separating the moving material objects of our ‘universe’ and those of the ‘super universe’ decreases, the progressive increase in the attractive force between them of course produces an accelerated rate at which they approach each other [acceleration under the influence of gravity]. In such a scenario, ‘our universe’ would continue to expand at an ever greater rate until ultimately being absorbed within the surrounding matter prior to the eventual complete collapse of the bubble containing our ‘universe’. If the matter of our universe is accelerating outward under the influence of an ‘external’ gravitational force then the distance between the objects in our universe will be increasing, with the rate of increase varying with distance from the ‘super universe’. Bodies significantly closer to our Light Horizon than the Earth is will be moving more rapidly under the expanding influence and will be accelerating at a greater rate than we are, thus producing an increasing Red Shift as the process continues. Bodies significantly further from our Light Horizon than the Earth is will be moving less rapidly under the expanding influence and will be accelerating at a lesser rate than we are. Because the Earth is moving more rapidly than these bodies under the expanding influence and is accelerating at a greater rate, the increasing distance between them and us is still detected as a Red Shift. The Red Shift is detected regardless of whether the emitter is receding from the detector or vice versa. What matters is that the distance between the two is increasing, thus the ‘receding’ photons that distant parts of the universe emit toward us will be ‘losing energy’ at emission, thereby being reduced in frequency, that is, they will be red shifted. Clearly, the gravitational attraction exerted by the ‘super universe’ upon objects in proximity [on a galactic scale] to each other will be very similar so there will be no expansion effect detectable between them. The above concept would eventually see everything we presently know of as the universe [billions of years in the future] merging anonymously into the greater body. Speculation about a super universe such as that envisioned above, leads to the idea that many ‘universes’ such as our own may occur as ‘bubbles’ within the Great Mass. These may perhaps be caused by localized, gravity induced concentrations of matter to a point where a massive explosion [a Big Bang] is required to release the accumulated energy, thus producing a bubble ‘universe’ similar to the one we know. If this is so, there is of course no possibility of information passing between any of these ‘universes’ and acquiring evidence for them would appear to be quite impossible. There is no claim here that this is ‘the true picture of reality’, only that the concept appears consistent with what we know and that if it were true there would be no ‘dark energy’ required to cause the expansion. Interestingly, at one time there was an hypothesis known as ‘The Oscillating Universe.’ Perhaps you are aware of it? It was quite unlike this version however. In the scenario depicted I suggest it would appear possible for the Super Universe to present a quite effervescent nature on a very long time scale with bubbles expanding and collapsing throughout its scope. Each individual ‘bubble’ would be a unique ‘universe’ of material that may essentially oscillate through successive expanding and collapsing phases. That property of matter which opposes its acceleration is known as ‘mass’. The concepts outlined in The Speed of Light and its corollaries may provide an explanation for the phenomenon of mass without a requirement to invoke agencies such as the Higgs Boson and the Higgs Field. Consider an atom possessing at least one ‘orbital’ electron [photon cloud]. It is hypothesized that any force applied to the discussed atom by adjacent atoms will tend to change the atom’s location through the interaction of the positive and negative fields of the atoms involved and that such motion will act through distorting the orbit of the atom’s photonic cloud. The forces maintaining the symmetry of the photonic cloud will oppose any distortion to photonic cloud symmetry and therefore oppose initial movement of the atom of which it is a constituent. It can be seen that the greater the number of electrons [photon clouds] making up an atom’s structure [and therefore the greater the number of protons/neutrons to also be accelerated] the greater will be its opposition to an accelerating force and this is seen as a greater ‘inertial mass’. Once an atom is in motion at the rate dictated by the initial accelerating force the atom is no longer subjected to photonic cloud distortion and will therefore continue in motion in the same direction unless subjected to a further photon field distorting force. The given concepts clarify the idea of inertia. Visualizing an ‘unbreakable’ bubble the surface of which is somewhat elastic, allowing it to be distorted to some extent before its surface symmetry is restored by the bubble moving away from the distorting ‘thing’, may assist with this idea. If the ideas in these papers are correct it means that although the inertia of a body, as well as the strength of its gravitational attraction for other bodies, are determined by the ‘amount of matter’ the body contains [atomic mass], the two features depend upon different aspects of matter for their behavior. Inertia: Matter with a greater number of protons and electrons [more mass] provides a greater resistance to accelerating forces as distortion of a greater number of electron fields [photonic clouds] act in opposition to these forces. Gravitational attraction: Matter with a greater number of protons and electrons [more mass] provides a greater number of unsaturated electrons [photon clouds] providing a greater residual positive charge and therefore a greater gravitational attraction for the electron fields of other atoms. Redefining ‘mass’ as referring only to ‘the amount of matter’ contained in a body would allow continued useful application of the word as it would persist in implying the concepts of inertia and gravity as hypothesized herein. It is hypothesized that when an accelerating force has been applied to an atom of matter and the atom has reverted to a symmetrical shape following acceleration, the force that had been applied has been absorbed by the atom in the form of an increase in the energy of its components. In the case of atomic photons it can be seen that this increase in energy represents a higher frequency [shorter wavelength] equivalent to the increase in the speed of the atom. It is taken that there is also a commensurate increase in the energy of the atomic nucleus. These frequency increases mean that the photons involved transition more rapidly between their energetic and material phases, conceptually spending less of any given period of time in the material state. Such effects will be negligible except at extremely high speeds but at such speeds the higher frequency [shorter wavelength] photons will orbit at a significantly decreased distance from the nucleus, thus giving rise to a slight shrinkage of the ‘size’ of the atom. As stated earlier in this paper, it is taken that in all of the changes that we observe in the normal ‘material’ world around us, the actual events that take place within the atomic structure can only occur due to the attraction and repulsion between atomic components. This means that ‘things can happen’ only during the material phase of the photons comprising matter. This also means that even if time always elapsed at the same rate [no dilation] there would be a lower percentage of that time during which events may occur if the ‘active’ percentage of each second was reduced by high speed caused, energy [frequency] increases. Imagine a situation where each section of time presented a portion of itself as a ‘window’ during which events could occur and that this window shrank as speed increased. Under extremely high speed conditions clocks would ‘tick’ significantly more slowly in comparison with those that were stationary .......and everything else would happen more slowly also but this effect would not ‘exist’ at all for those travelling at such high speeds. All events, including every chemical, electrical and biological aspect of a physical person would take place in a smaller portion of ‘real time’ than is the case for the same person when ‘at rest’. ‘Things’ in fact happen at a ‘slower pace’ at high speed because changes only occur during a smaller fraction of actual time than is normally the case. Time can be considered to be continuous and invariant. 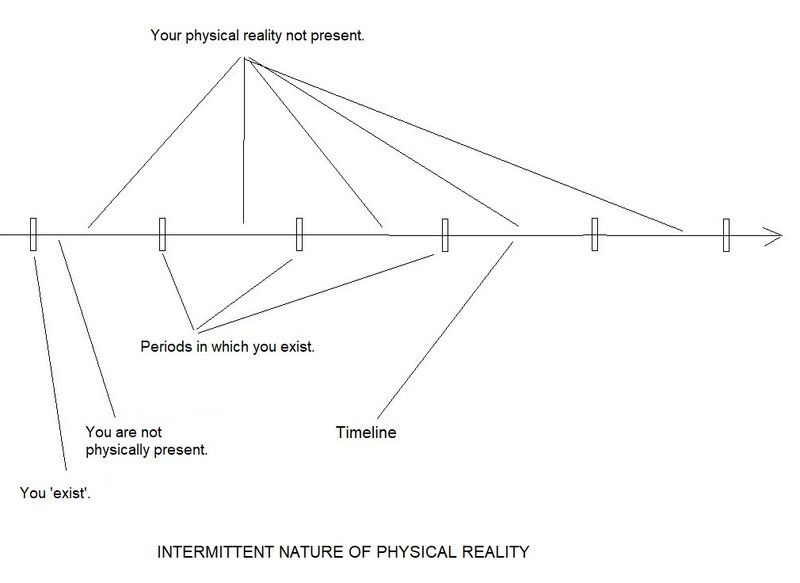 Events and our perception and measurement of them may only occur during the portions of time during which energetic entities such as photons exist as material objects with mass and charge allowing them to interact with similarly endowed entities. It may be seen that events on the macro scale [the ‘real world’] occur and are evident as the instantaneous aggregate of individual atomic scale events integrated by our senses. Hypothesis:- Matter is a consequence of the interaction of moving charge carriers. If The Speed of Light hypothesis is correct we may be able to take useful inferences from it regarding the formation of matter. Because like charges repel and unlike charges attract it can be seen that The Big Bang may have been a vast source of moving positive and negative charge carriers [energy ‘particles’], radiating away from an origin. If these charge carriers comprised energy that propagated and behaved as described for photons in the ‘The Speed of Light’ hypothesis it is seen as likely that the extensive and continuous spectrum of energy levels [‘frequencies’] produced in The Big Bang would have resulted in a very wide range of deflection angles as charge carriers of the full range of energies [same polarity, equal or differing charge intensities] repelled each other. Because positive charges would have commenced to diverge from each other under the influence of their mutual repulsion and negative charges would have done likewise this particle path deviation would have caused the subsequent convergence of many charge carriers. Path coincidence of such deflected charge carriers would lead to cascading deflections in what would, essentially instantly, become a ‘boiling maelstrom’ of swirling energy and ultimately, particles of matter. It is hypothesized that positively and negatively charged particles will be drawn together if their paths converge and their charge presences coincide in time and location. The outcome of such physical attraction will be determined by the energy relationship between the particles involved. Should positive and negative particles of equal energy [same ‘frequency’] coincide as described they will continue together on a path resulting from their angle of incidence. They will then be closely associated particles appearing as one entity possessing the combined energy and mass of its constituents.This new ‘particle’ will exhibit zero charge externally to itself except at extremely short distances however* owing to the opposite and equal charges of its component parts masking each other’s charges. Note that the combined particles retain their prior individual identity and characteristics despite being ‘locked together’ by their charge relationship. It should be clear that such a particle association continues to acquire mass and be limited in speed in an identical manner to that discussed for photons in the The Speed of Light hypothesis. The particles described above would behave in the manner of the particle known as the neutrino. In possessing essentially zero exhibited charge, these entities are normally neither attracted toward nor repelled by the charges presented by atoms and therefore may only very rarely interact with other matter. Positive and negative charge carriers that differ only slightly in energy have almost identical transition periods [repetition rates]. If the material presence of two such items occurs simultaneously in close proximity to each other the mutual attraction will cause the two to unite as occurred in the case of the neutrino. On subsequent materializations such entities will emerge slightly spatially separated from each other however owing to their non-identical ‘periods’ [conventionally referred to as ‘wavelengths’]. If this occurs with sufficient propinquity the two physical particles will be drawn together once again by their charge attraction. This process will recur indefinitely, with a resultant ‘virtual’ period for the new object falling between the repetition times of the original energy components. This will happen because the physical presence of the higher energy particle will appear on each occurrence at a slightly earlier time (shorter distance) than the less energetic particle, drawing the first particle slightly forward and the second particle slightly backward in space and producing an overall combined ‘measured’ speed (distance divided by time) that is lower than would otherwise be the case. That is, the new [combined] particle of matter will travel at marginally less than the speed of light even though comprised of entities that individually attain the same maximum speed that limits all entities. The minute material object formed in such a union will continue to exhibit a small residual charge as in the case of the neutrino but as the physical association of the particles is more distant in this case and their charges differ slightly, the charge affecting other objects will operate over a greater distance and be dominated by that of the more energetic particle. This allows them to repel and attract other entities depending upon relative physical charge orientations and this may lead to the accumulation of equivalent entities causing the formation of more complex matter. Such accumulations may conceptually consist of pairs or groups of pairs bound together in chains of progressively greater energy difference. Particles of matter taking such a form may collectively travel at a considerably lower speed than the transition speed of its constituents, that is, well below the speed of light. It is suggested that a process such as that described above ultimately results in hydrogen atoms comprised of individual photons both positive and negative, which individually cycle through the energetic and material states and propagate at ‘the speed of light’ but provide no nett accelerating force for the atomic entity as a whole. Photon pairs comprised of two very low energy [very long repetition period] components will exhibit extremely low charges even in very close proximity to the combined entity and this, in addition to their widely spaced charge maxima, causes interaction with much slower moving matter accumulations [normal matter] to occur only rarely. Several distinct combinations of this nature are likely to occur where one pair of photons differs from the next on the basis of energy. This would produce neutrinos of several energy levels. While perhaps seemingly inconsistent with proper instruction, it is sometimes useful to allow an initial false image to persist sufficiently to permit intermediate concepts to be fully grasped before continuing to more subtle aspects of reality. In this way, unfamiliar and possibly difficult ideas may be introduced one at a time rather than overwhelming the mind simultaneously with a combination of many new and interrelated images. An example of this approach is illustrated in this article by the discussion regarding the relationship between photons and the atomic nuclei with which they become associated. Despite what has been said earlier in this document there are, in this hypothesis, no photon 'orbits' around the protons to which they are attracted. In addition, the concept of a 'virtual wave-guide' within which photons become trapped is another useful conceptual fiction employed in the pursuit of an ultimately more complete understanding. Consider the interaction of the positively charged nucleus of an atom with the photons as described previously in this paper. A photon approaching an atomic nucleus cycles through the energetic and material states previously described at a rate determined by its energy level. A high energy photon materializes more frequently than a low energy photon, thus its material states occur more closely spaced together. If a negatively charged [materialized] photon appears within acquisition range of the positive charge of an atomic nucleus it is drawn toward that nucleus. Several possibilities now exist as the photon dematerializes and continues in its previous direction toward the nucleus as a packet of essentially uncharged energy. As the energy packet continues through the nucleus without interaction, it progressively acquires mass and charge as it travels. What occurs next is determined by the repetition period [spatial distance between material occurrences] of the photon and by the strength of the charge of the nucleus [number of protons]. Having passed through the nucleus, if a photon has gained sufficient negative charge while still within acquisition range of the charge of the nucleus and if its momentum is sufficiently low, the photon will be pulled back toward the nucleus. For a limited range of photon energies and nucleus charges, a photon that passes through a nucleus as described, will become trapped within a continuous cycle of sequential passes through the nucleus under the influence of charge attraction. Such a photon will then repeatedly present its most highly materialized and charged state at a distance from the nucleus determined by its energy and the nucleus charge of the atom [number of protons]. Photons materializing less frequently than those described above, having passed through the nucleus without interaction, only acquire significant negative charge beyond re-acquisition range of the nucleus charge and will thus avoid capture. While circumstances for higher energy photons are less clear to this author, it is speculated that they may have sufficient momentum to avoid capture. It can be seen that the acquisition of many photons by an atomic nucleus will produce a 'cloud' of such photons materializing at a distance from the nucleus determined by their energy level. Mutual repulsion between the negative charges of these photons will lead to their balanced distribution around the nucleus in the form of an 'electron' as previously described in this paper. No 'orbital' energy losses are involved as the 'electron' is not orbiting the nucleus as historically imagined. It may now be seen that the 'orbital distance' relationship to the energy of the electron [photons] arises from the repetition period of the photons involved rather than the 'wavelength' of a perceived electromagnetic wave. What has previously been referred to as a virtual wave-guide can now be seen to behave as what may be termed an infinite Q [lossless], virtual resonant cavity. From this point, the behavior of atomic photons in regard to atomic absorption and emission, as well as to magnetism, is as previously explained in earlier sections of this paper. A persistent failure to grasp the true nature of the photon unavoidably denies the theorist an understanding of the electron. In the absence of knowledge of the structure and behavior of the electron there is no possibility of comprehending the observed and well documented characteristics and behavior of matter. The above two deficiencies in human knowledge provided an insurmountable roadblock to the advance of science and in themselves represent a disappointing intellectual failure to combine seemingly conflicting ideas into what should be seen as almost self-evident conclusions. The inexplicable failure of the quantum pioneers to reconcile their different ideas may indeed be an outcome dictated by the emotional frailty of human beings rather than by any lack in reasoning power. The wave and particle views of reality were essentially championed by different individuals, and although Bohr came tantalizingly close to cracking the code*, an obstinate failure of individuals to modify their firmly held hypotheses, denied us a true picture of reality and left the scientific world ripe to accept any idea providing some form of ‘answer’. It should by now be clear that both were indeed essentially correct if the energy phase of a photon’s path is seen as an intellectual ‘equivalent’ of the non-particle behavior seen as waves. Perhaps this is overly generous to the wave side but the particle side with its ‘uncertainty’ had its problems also. It is of course impossible to envisage today’s scientific and technological outcomes in the absence of some form of resolution to the wave-particle conundrum. To the enduring dissatisfaction of several of the most prominent scientist of the day, science essentially discarded the concept of cause-and-effect at the quantum scale in accepting uncertainty as an inherent property of 'wave mechanics' at the quantum level. This provided theoreticians with a fruitful working hypothesis but also with a convenient escape from a need to resolve the wave-particle question, which appears to have been placed in the category of ‘inherently unknowable’. A seemingly acceptable state of affairs. Unfortunately [probably] for humanity and generations of scientists riding on his coat-tails, acceptance of inherent uncertainty initially arose, it would appear, when Heisenberg found the beginnings of ‘an answer’ to the problem of the anomalous Zeeman spectral emissions in June 1925. The application of matrix multiplication to an analysis of the atom by Heisenberg, Pauli and others along with the Born Rule on probabilities in the following year provided an ‘answer’ that has to date led the greatest minds of the last 100 years or so on a merry chase through a land of mythical creatures. In applying the mathematically useful concepts of matrix multiplication to solve the real-world issues raised by the Zeeman effect and the Stark effect, these men caused the theoretical exploration of reality to not only abandon the concept of a cause-and-effect universe but also essentially decided that things equal to the same things were no longer always equal to each other. The good ship ‘Fantasy’ had been launched and no amount of skillful navigation could possibly steer a correct course once the initial leg had been sailed. In my view, the superior intelligence possessed by the majority of those that now crew The Fantasy have learned their navigation lessons well and it is my expectation that not one of these will find themselves capable of abandoning ship in the lifeboat provided by this document. I hope of course that I am wrong in this, and that Max Planck’s requirement for the current crew to die off before new ideas can be considered, is also wrong. Superior intelligence is, I think, merely the ability to easily and quickly grasp the concepts put forward by others and in no way guarantees, or even commonly accompanies, a reality grounded imagination. I sincerely hope that I am in error in this assessment, will be elated to discover this to be the case, and that those presently distracted by currently accepted ideas will create great things from a true understanding. My concerns for the welfare of those whose careers are intimately tied to current quantum physics concepts, while real and significant, pale in comparison with my concern that a better understanding of the universe as presented in this document may enhance man’s chances of inflicting his dangerous nature upon the stars. In aggregate, we show no sign of what I hope will be a new evolutionary step that will take humanity away from our overwhelmingly selfish behavior. Life, if not indeed unique to this one planet, is, in my view, almost certainly rare to the point that we may never meet a creature not of this Earth, let alone an ‘intelligent’ one. If this is so, perhaps in the interests of the continued existence of any form of life at all in the universe we should spread the seeds of our planet as far and as widely as possible irrespective of the consequences for individual life-forms? Of course the distances involved, our present understanding of possible means of travel and the hazards of interplanetary and intergalactic space suggest that we will never venture far from Earth in any meaningful way, so our options appear limited in the absence of some dramatic and as yet unseen breakthroughs in science. Perhaps the development of a Photon Drive of some description will provide us with the means to go to the nearer stars with acceptable travel times [see sites referenced in the topic ‘All Motion Is Relative’] and we may even overcome the other interesting challenges confronting travelers in interstellar space. If you are interested in just why I think life is an extremely unusual occurrence, perhaps you should read my science fiction novel ‘Weep Not For The Stars’, available from several e-book publishers? It would seem that much more than just a ‘Goldilocks zone’ planet plus water is needed for life to arise. Perhaps True Science will be found to be consistent at the macro and micro levels after all, as the thinkers of today find the deterministic picture of quantum mechanics outlined herein increasingly convincing? While Feynman may not have angled his thinking in such a manner as to perceive the possibilities presented by the ‘answers’ provided in this article, without him I would have been completely unaware of the questions. I admire and respect the towering intellects of Feynman and others who have been able to intellectually grasp the incredible complexities presented by the concepts of ‘uncertainty’, whether they are true or not, and whether or not the ideas herein ever gain acceptance I have enjoyed the journey these wonderful people have given me in my pursuit of understanding. Should any modern day champion of complex ideas find within him or her self the ability to return control of their thinking to their conscious selves rather than relying upon their deeply burned subconscious ‘knowledge’, I suspect they would be able to extend ‘The Speed of Light’ to extraordinary places, places where the prospect of unlocking truly astounding things exists. It should be noted that cause and effect obscured by complexity present a picture not easily subjected to logical analysis. This should in no way allow us the excuse that ‘some things are not meant to be understood by us’ as they are inherently ‘mysterious’. The idea of an underlying and fundamentally mysterious nature to the physics of the universe is akin to a belief in an underlying and fundamental uncertainty in the behavior of aspects of physical reality. Einstein, although unable to refute them, abhorred such concepts. Acceptance of things such as the uncertainty principle allows us to be convinced that there is no alternative to the magical image of the universe drawn by ourselves throughout the 20th century and that some things are not capable of logical analysis. Many brilliant minds may have been distracted by pretty baubles hanging in the trees on tracks leading away from the path of knowledge and may have therefore failed to pursue the mundane [and perhaps boring] bread crumbs at their feet. Intelligence provides no protection against the disease of belief. Superior intelligence permits more robust support for invalid assumptions. I may be hopelessly and irretrievably wrong in what I have presented to you in this article but it is hoped that I have directed your attention to a few useful bread-crumbs rather than distracting you with nonsense. What if this model for electromagnetic propagation is correct, however? I face the prospect with some trepidation. While resolving issues that have provided barriers to understanding for more than a century, the ideas in The Speed of Light, if true and accepted, could be responsible for ending many careers. Such an outcome would weigh heavily upon me but I comfort myself a little with the thought that many resources [human and material] are being wasted in search of phantoms and that perhaps these resources could be applied to research along new and productive paths. Great minds, in accepting the view described herein, would be freed from the pursuit of false but exciting and ever cascading esoteric concepts and become available to follow new ideas to useful destinations. Perhaps everything would consequently be too simple for them? If so, they will need to exercise self discipline in avoiding future distractions. I hope they find the ‘cage’ of reality truly does contain some interesting creatures. How could ideas requiring a rebuilding of much of current physics possibly be true? How could everyone have overlooked such ideas in the first place? The obvious answer is that the ideas contain no validity. Others must of course decide whether or not this is true. If you are able to disprove the hypothesis put forward in this document, please do so and the material will be removed from publication, but I ask that you keep in mind my emails to the editors of Skeptic and Skeptical Inquirer and my statement that: “No doubt physicists can put forward mathematical ‘proofs’ debunking my ideas and these would gain ready acceptance by their peers and be considered to put an end to the matter, however, please accept that any argument addressed to me would need to be in words [and perhaps diagrams] rather than any other form of symbology.” Unsupported criticism will be ignored. Almost all of those invested in previous thinking will be unable to make the transition to a simpler view of reality. Indeed they will be unable to even give logical consideration to such a picture. This is understandable. Who would be able to willingly consign their own acclaimed works to the dustbin? Who would be willing to declare that the books and lectures they labored over so tirelessly were of no relevance? Remember - Question ALL Things. ‘The interpretative confusion surrounding modern physics is revealed in two propositions that contradict common experience but are accepted as indisputably true by quantum mechanics. 1) Quantum entities, such as photons or electrons, have no precise location in space or they have no precise momentum. According to Professor Feynman, when a fixed source of monochromatic light is directed orthogonally at a surface, of water for instance, a fairly consistent percentage of photons is found to be reflected [2% for water; 4% for glass, with yellow light for example]. In the water example with 2% reflection for yellow light, the claim was made that in each 100 incident photons there would, on average, be two reflected but the determination of ‘which two’ was purely a matter of chance. It was stated that the result was a matter of statistical probability subject to fundamental uncertainty. While acceptance of ‘the uncertainty principle’ is deeply embedded in the collective mind of science today, it should be seen as scientifically valid to subject even this idea to close scrutiny in the spirit of questioning all things, especially strongly held ‘beliefs’ [ideas for which there is no proof]. Ideas which, if true, would serve to undermine central doctrine can hardly be expected to be welcomed with open arms by those with careers and egos committed to the status quo but this should be no impediment to their pursuit. Note: There is no requirement for the observer to be able to determine ahead of time which photons will be reflected for direct causation to exist. ‘Unpredictable’ is not the same as ‘fundamentally indeterminate’. If this hypothesis regarding photon propagation is valid this would mean that each photon is emitted at high speed as a full-energy entity lacking significant charge or mass. Travelling at ‘the speed of light’ each photon will transit through a number of energy/matter cycles before arriving at the reflecting ‘surface’ used in the experiment. The number of cycles in each case is determined by the energy [repetition rate, or period] of the photon [570nm to 590nm for yellow light, or about 1,700 times for each millimeter of travel] and the exact distance between the point of emission and the point where the photon would be influenced by the electric field of a molecule in the reflecting surface. This exact distance determines the matter/energy phase of each photon at the time it may have its path influenced by the electric field of the reflecting ‘surface’. If the propagation distance was precisely identical for each photon this would result in either all or none of the photons being reflected. The fact that some photons are reflected but most are not [in this example] indicates that the propagation path of the photons varies in some manner from one to another and/or other factors are involved. It would be tempting at this point to propose that this variation is itself an embodiment of the uncertainty principle but examining reality more closely reveals that this is likely not to be the case. b) the positions of the individual ‘reflecting surface’ molecules potentially involved. Each of the above could potentially, and seems very likely to, differ from photon-to-photon to some degree in a manner presently beyond our ability to detect, thus causing a photon-to-photon difference in distance travelled and therefore removing any need for statistical probability guided by uncertainty as the reason for any variation in photon reflection. Precise measurement of the propagation distance for each photon [if possible] would reveal whether or not it would be reflected, with the ‘wavelength’ [period] of the photon and the molecular structure of the reflecting ‘surface’ almost certainly found to strongly influence the resulting percentage. It must be kept in mind here that the molecules of both the source and target are in a constant state of thermal motion. In the absence of specific information regarding emission source characteristics and taking the view that various experimenters are presumed to have achieved similar results [for water for instance] no doubt using a variety of photon emission sources it seems reasonable to conclude that the observed characteristic reflection percentage for a particular material ‘surface’ is essentially determined by the nature of the ‘surface’ itself and the ‘wavelength’ of the photons involved. When the ‘fixed source’ of monochromatic light used in the previous example is directed orthogonally at a glass surface, it has been found that the photons reflected from what was claimed to be the upper surface are about 4% of the incident number. It has further been found that the percentage of photons reflected from glass depends upon the thickness of the glass, that is, it was claimed to depend upon the distance between the 'upper' and 'lower' reflecting surfaces, and that such photon reflection is between about 8% and zero depending on the glass thickness. In some manner seemingly ineffable to proponents of the probability concept, in combination with the purely particulate view of electromagnetic propagation [no energy phase], according to their interpretation, changing the thickness of the glass causes reflections from the lower reflecting surface to either add to or subtract from reflections from the upper surface [in some unspecified manner], resulting in detected reflections ranging from much brighter than from one reflecting surface alone, through to total blackness where complete cancellation occurs. If the hypothesis in this article is correct it can be seen that there is no requirement to invoke a probability clause to explain the described behaviour. It will also be seen that the mechanism involved does not rely upon surface reflections. In accordance with the fundamental concept of the propagation of photons as set forth in this document it can be seen that photons approaching the ‘surface’ of a sheet of glass will interact with the glass molecules they encounter as described previously. This interaction will depend to a great extent upon the repetition period of materialization of the incident photons. Caught out in his oversimplification in referring to ‘surface’ reflections in his explanation, Feynman later admitted that detected reflections from glass result from the combination of reflections [or emissions] of his light particles from the atomic structure of the glass but that he had avoided such detail for simplification purposes. Feynman’s non-simplified explanation is essentially identical to that put forward herein although he provided no mechanism for the interaction of light ‘particles’ with matter. In their material phase, negatively charged photons passing among glass molecules will be reflected by the negative electron field charge of nearby atoms. The angle at which a materialized photon approaches the electron field of an atom determines the angle at which it will be repelled [reflected]. As photons reflected by molecules located in the lower regions of the glass in the form of repelled negatively charged motes of matter travel toward and through the upper ‘surface’ they continue in their normal manner of propagation, passing repeatedly through the electromagnetic and material modes of their existence. The ‘phase relationship’ between photons reflected from the lower regions of the glass and that of those entering among the molecules in the upper regions of the glass determines whether or not individual photons coming within range of each others negative fields during the material aspect of each will have their paths deviated by the encounter. 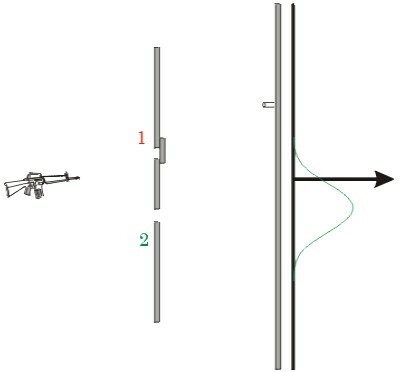 Analysis of the reflection of photons within a transparent material such as glass will reveal that altering the thickness of the material causes a variation in the location of materialized reflected photons with respect to each other such that when in close proximity, mutual repulsion results in a varying number of path deflections. This causes a variation in the number of photons being scattered to add to the thermal load of the glass rather than continuing uninterrupted to exit the glass as a ‘reflected’ photon. 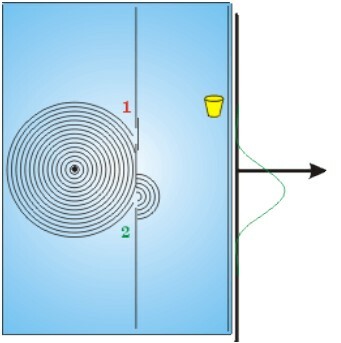 Some particular separation distances between the two reflecting surfaces will result in a complete absence of such interference between the two reflection streams and in such instances the detected reflection percentage will be a maximum determined by the molecular structure of the medium and the ‘frequency’ of the photons involved, and in the case of glass this will approximate 8%. Another particular glass thickness will result in the path deflection of all reflected photons, resulting in zero light being received at the detector. It should be understood that material thicknesses resulting in zero reflected photons being detected is not the result of some kind of ‘anti-phase’ cancellation of their energy. The photon energy has merely been distributed within the material of the glass. Appropriate diagrams would perhaps be of some value here. Should the concepts described gain any degree of acceptance I will leave their provision to those far more adept than myself at such things. Considering the simplicity of the visualisations involved it is likely that no diagrams are necessary however. If matter is only periodically present in the manner described we are presented with the implication that a Multiverse of a nature different from those presently proposed is possible. Consider a Pulse Train of a given PRR [Pulse Repetition Rate]. Other pulse trains with a Repetition Rate exact multiples of the given PRR or for which the reference PRR is an exact multiple will provide pulses synchronous with the given PRR in an exact and predictable manner if any pulse of such a pulse train coincides with any pulse of the given PRR. Otherwise there will never exist any coincidence between any pulses of the two pulse trains. Pulse trains with a Repetition Rate unrelated to that of the given PRR [not exact multiples or sub-multiples] will rarely provide coincident pulses. Pulse trains with a Repetition Rate very close to that of the given Pulse Train will provide very infrequent coincident pulses. Very many pulses of one or the other pulse train will need to be produced prior to coincidence when a pulse train with a Repetition Rate very far from that of the given Pulse Train is compared with it. Non-synchronous pulse trains occurring at an identical rate to that of the given PRR will never provide pulses coincident with those of the reference Pulse Train. It is postulated that Universes presenting a periodic material presence in the above manner will co-exist in the same space without interaction between them. If the material universe formed from a ‘sea’ of energy as suggested earlier in this paper it may be seen that alternate physical realities in the same spatial location could be anticipated to form material bodies of a similar nature to each other. This presents the possibility of an essentially identical Earth existing in a ‘time slice’ adjacent to our own but forever inaccessible. ‘Emission’ in this sense applies to photons emitted by a stimulated atom; photons reflected as described; photons emitted as ‘thermal’ photons; or photons produced in atomic decay.